It was Iceland for the November 2013 Virtual Paintout. I really enjoy participating in the Virtual Paintout each month. 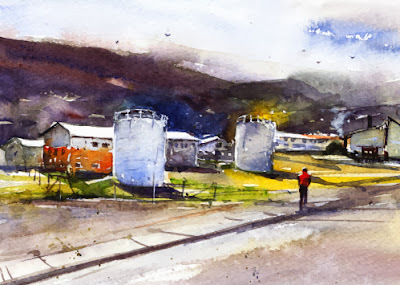 I'm sure I'll never get to see Iceland in person, so I can at least see some of it with Google Street View which artists use to find their virtual location to paint. Last month in Lima, Peru, I enjoyed painting some grand official-looking buildings and looked for a "capitol" area in Reykjavik but didn't find it. I'm sure with devoting more time to browsing I would find what I was looking for. One waterfront tourist area with whale watching tours caught my eye and I kept going back, even though on the day the Google car was there it was very overcast. I tried that view in gouache. I finally found some sun in another area for my second painting. One thing I've noticed from browsing around cities for the Virtual Paintout challenge is the graffiti. It's pervasive, spread throughout the world, even Iceland, which surprises me. Looking forward to the location for December! After years of illustrating hundreds of greeting cards I was thrilled to find out that many beautiful, vintage cards are still available. It's been really interesting and inspiring to see the gorgeous and changing graphics and illustration styles over the years. I've accumulated quite a few from past decades, and I think the holiday cards are always my favorites. 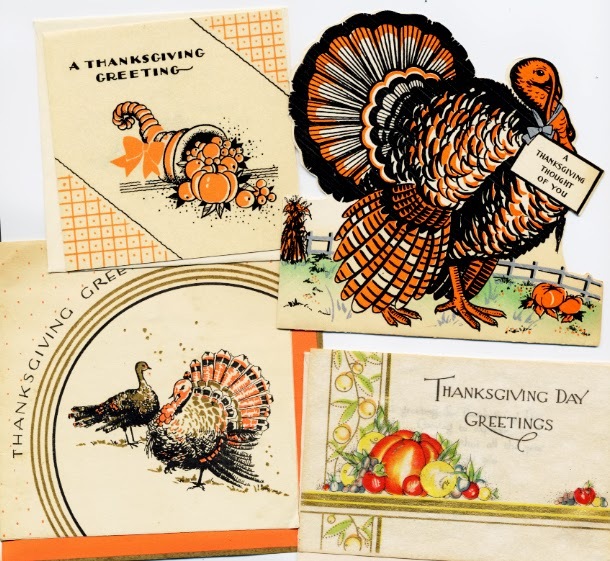 I hope you enjoy four Thanksgiving greetings from the 1920's, and have a wonderful holiday! 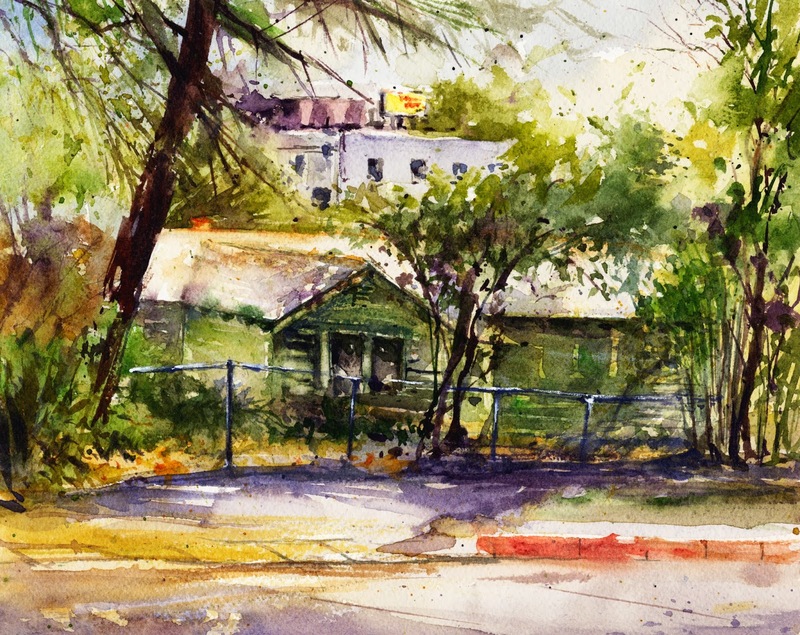 Peck Road Park is such a calm and lovely place to paint that I was excited to have it as a paint-out location again. I was just there in October with another group and wrote about my visit, and two paintings in Peck Road Park. As I mentioned in my last post, there was a lot of construction going on which is continuing. They are making some nice boulder-lined paths and adding some plants. The park seems to be a work in progress. 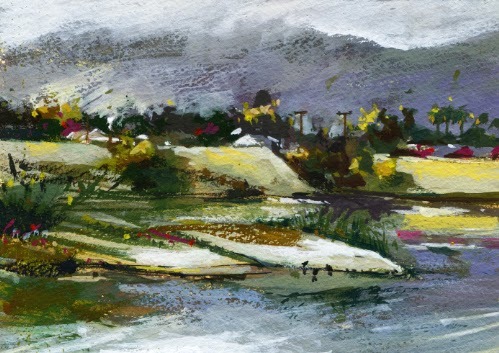 It's the beautiful lake and mountain views at Peck Road Park that are irresistible to paint. Both times I've visited, the mountains have been overcast by a cloudy, gray sky which changes constantly. It's fantastic to watch the reflections in the lake water transform with the changing clouds and sky, which makes it a challenge to paint. We just have to start with what reflections we see and try to remember how they looked. Of course there are many birds to watch as well. I thought I would just paint a watercolor but then couldn't resist trying to squeeze in a smaller gouache of the same view in the time I had. 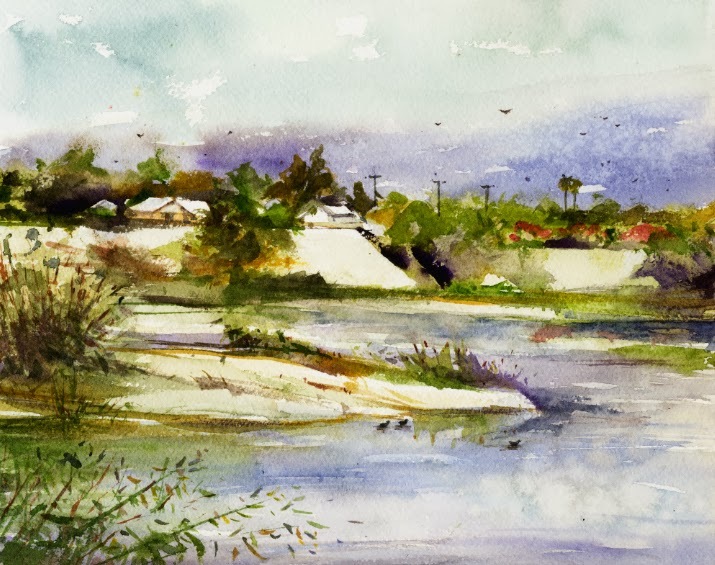 I painted from a different part of the park from my last visit and realized there isn't much color there, except for some magenta bougainvillea on a far embankment. Since I missed adding a visiting egret, I added three mud hens (coots) in each piece. I'm looking forward to our next visit. I noticed Joseph Zbukvic's newest DVD is titled People at Work in which he paints a lot of figures. One of the examples from the trailer is his demo of some men working on road construction. Their orange and yellow vests reminded me of a gouache piece I painted of workers wearing the same vests which I hadn't posted. A location for one of the paint-out groups in August was at the Los Angeles County Arboretum. 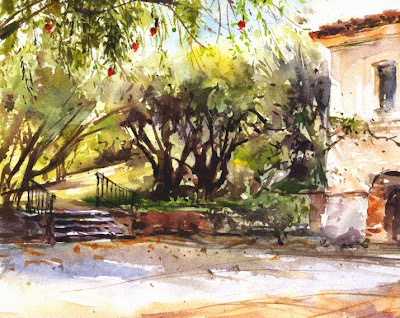 It's such a lovely place for plein air artists that I've done four previous blog posts of pieces painted there. It was a very warm day so I didn't venture far from the entrance area and the cafe where we meet to look at each other's work. 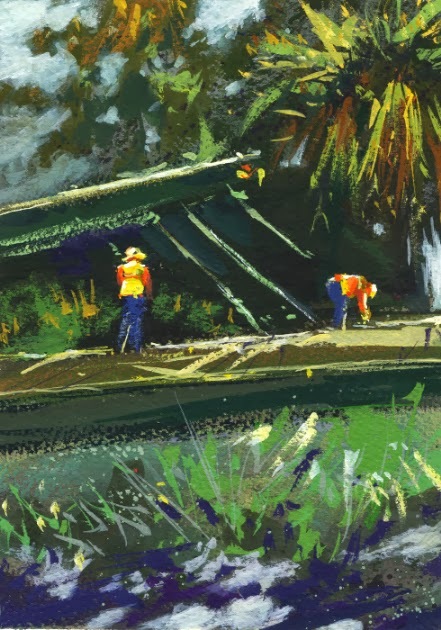 As soon as I started walking in search of a view to paint I noticed some men working on re-roofing the gift shop building. From one of the walkways, I had a great view and they were so colorful that I had to try a painting. I used gouache because of their bright vests which really caught my eye. I really enjoy these not-so-romantic subjects. We always have peacocks checking out the art. 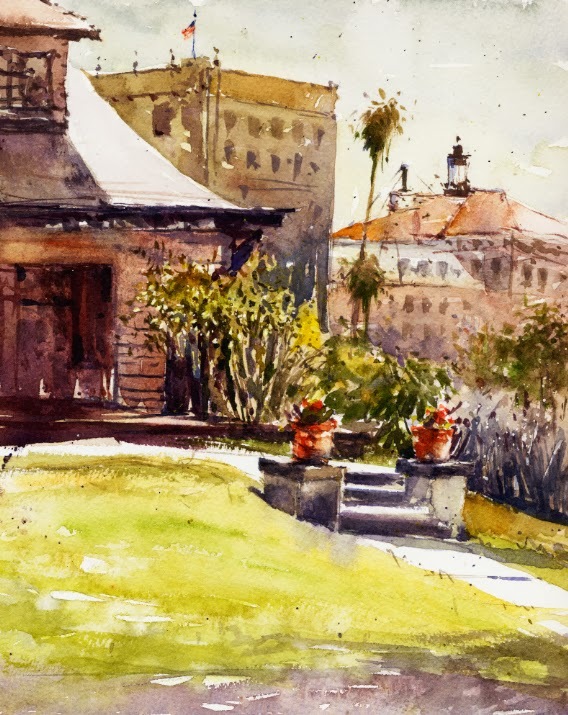 One of the plein air groups had the Wrigley Mansion on the schedule for this month. Since 1958 it's been the headquarters for the Tournament of Roses which organizes the famous Rose Parade on New Years Day in Pasadena. The Wrigley Gardens is an official test garden for the American Rose Society with 1,500 roses. 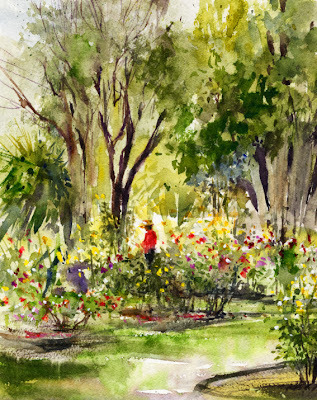 I painted there in June with two paint-out groups and the roses were gorgeous of course, my three paintings posted in The Wrigley Gardens. Since it's Southern California I was confident the roses would still be very lovely in November. The roses weren't disappointing and were still gorgeous. Since the garden is a test for some new roses, I noticed a bush of chocolate colored flowers. Definitely not my favorites but might be nice for a certain color scheme. I painted one watercolor that went pretty well and added a figure for some interest among all the foliage. During the morning, a security guard told some of the painters who were out on the sidewalk painting a view of the building that a group would be demonstrating at noon. Since it's the headquarters for the Rose Parade which features floral floats, the group was protesting some aspects of the Sea World float and wanted it banned from the parade. An ABC News crew also arrived. Two of my artist friends were interviewed about the demonstration, but their segment didn't make the 6 o'clock news when the story aired. It was another beautiful day in October for a paint-out with one of the groups at the The Old Mill, El Molino Viejo. The wonderful old adobe building, from 1816, and surrounding patios and gardens had some lovely fall light. The California Art Club maintains a permanent gallery in one room so we also wanted to see the current show, The Missions of California. I've painted at the Old Mill quite a few times now and have posted all of my watercolors and one gouache piece. My last post about painting there was Spring at the Old Mill. And almost exactly a year ago, I painted two pieces in the Pomegranate Patio, The Pomegranate Patio. A visit and paint-out there seemed appropriate for fall 2013. In October last year, the pomegranates were everywhere but this year I guess they got ripe earlier and most were picked. I had to add some of the remaining fruits to my view since some nice red ones were hanging over where I was sitting. Now I'm looking forward to a spring visit. Arlington Garden in Pasadena, California is such a special place. It's a public/community garden which is unlike any other garden. The plein air painters were there every week in the spring when it was full of flowers and butterflies. Every group I go on paint-outs with visited so I think I've painted there six times now. 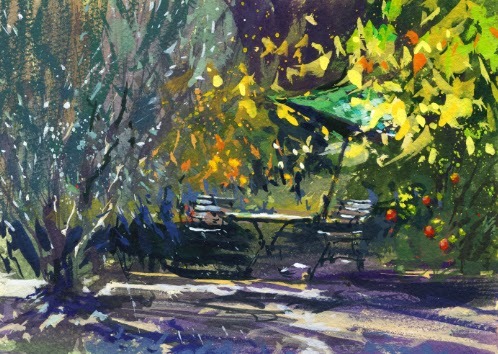 When we met at the garden last month I was excited to see what I might find to paint in the fall season. Arlington Garden is made up of many "garden rooms" and "plant communities" which all change with the seasons. It was a beautiful morning for a visit and I was inspired to try a watercolor as well as a gouache. After looking around at the variety of fall views, I settled on the Mediterranean Allee area. This "room" is considered more formal with Spanish lavender planted between two rows of olive trees, with a pomegranate tree in each corner. There are chairs, tables, and even room to play bocce. 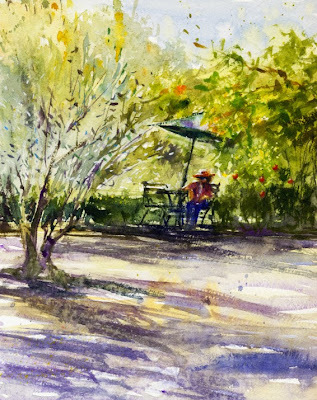 From the quiet table I found on one end of the bocce court, next to the olive trees, I painted my two pieces including some red, almost ripe, pomegranates to add some fall color. Our wonderful Saturday plein air paint-out group visited Champion Place last weekend. In Alhambra, California, just a few miles from where I live, an artist's colony flourished in the 1920's and 1930's. It was mainly situated along Champion Place, only a block or so long. It's a narrow, unassuming street, but it's very picturesque, overlooking an arroyo with many large eucalyptus trees. The founders of the small creative and supportive group attracted a lot of other well-known artists and famous personalities. In 1915, one of the founders, Victor Clyde Forsythe, became unknown illustrator Norman Rockwell's mentor. Years later in 1929, Rockwell visited Forsythe at Champion Place and met his second wife there. The Rockwells visited Alhambra often from New York, sometimes staying the whole summer. Norman Rockwell was seen bicycling daily around Alhambra, and he sought out local faces for his illustrations. It was fun to visit narrow, historic Champion Place and find a view to paint. While we were painting several homeowners stopped to ask us if we knew it used to be an artists' colony and that Norman Rockwell lived there. I chose a rustic home with a bit of some commercial buildings showing in the background. The homeowner arrived halfway through my watercolor, parking directly in front of what I was painting. He kindly volunteered to move his car. I'll enjoy giving him a print of my painting. I came across a watercolor from a couple months ago that I haven't posted yet. I painted it on a Saturday paint-out with the group at Fuller Theological Seminary in Pasadena. This location was also where I first painted with the Saturday group over a year ago. 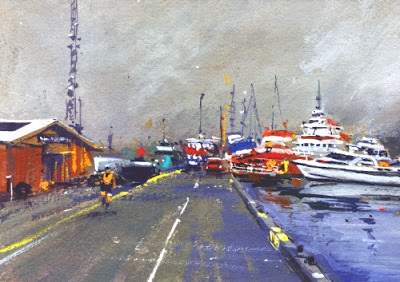 At that time I had only been to a few plein air paint-outs and although I liked a couple areas in my painting, I was hoping to improve on my second visit. The Fuller campus is located in what was a residential neighborhood. It was a very fine old Pasadena neighborhood with large, beautiful homes which are now used by the seminary. 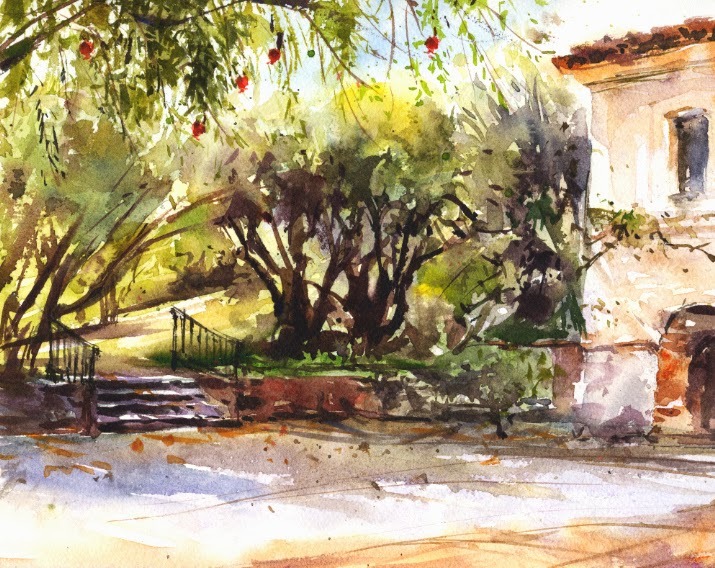 The homes are still on their old street, surrounded by mature trees and lovely gardens, a really pretty place to paint. I chose a view past one of the old homes to some of Pasadena's downtown buildings for some background interest.